KEY WEST, Fla. — Coming face-to-face with colorful parrotfish, various schools of angelfish swimming in perfect formation, and spotting a variety of coral, it is difficult to not become bewitched while snorkeling in Dry Tortugas National Park. Established as a national park in 1992 by Congress, Dry Tortugas is found about 70 miles west of here. 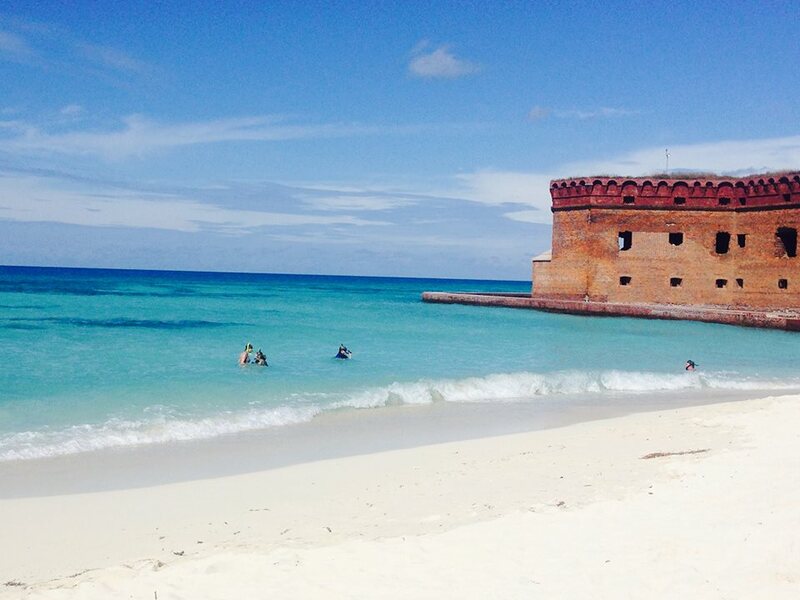 Fort Jefferson, located on Garden Key, which is part of Dry Tortugas, comes into view as the Yankee Freedom III makes its arrival (Photo by Roxana Maza). Seven islands make up the Dry Tortugas, known as the Garden, Loggerhead, Bush, Long, East, Hospital and Middle Key. Dry Tortugas is located between the Gulf of Mexico, the western Caribbean, and the Atlantic Ocean. Boasting a myriad of marine life on its seven keys, visitors to the Dry Tortugas interested in snorkeling may have the chance to do so during their stay. Visitors coming to the Dry Tortugas via the Yankee Freedom III will find that they can rent snorkel gear for free at about 10:45 a.m., which must be returned prior to the ferry’s departure at 3 p.m. Since there are fresh water showers located at the back of the ferry, snorkelers who wish to rinse off before returning to Key West should re-board at least 20 minutes prior to departure to allow sufficient time to rinse, dry off and change. 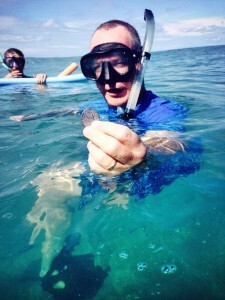 Snorkeling on Garden Key, which is where Fort Jefferson is located, can be fruitful if visitors are knowledgeable of what the best snorkeling locations. Click on the video at the left to view an audio slide show about snorkeling in Dry Tortugas National Park prepared by writer Roxana Maza. “You have the North Coaling Docks, which you get to by swimming out on the North Swim beach and go around it (to the right). That’s my favorite spot,” recommended Capt. Rick Gauron of the Yankee Freedom III. Capt. Rick, as he likes to be called, has been working with the Dry Tortugas National Park since 1978 and has been operating the ferry trip for the past 20 years. Other recommended spots include the South Coaling Dock ruins, which can be accessed by swimming out from the South Swim Beach, located on the left of the ferry dock. The coral heads are also a must-see for snorkelers and can be reached by starting a swim to the right from the South Swim Beach, as if heading toward Loggerhead Key. However, because it is about an 80-yard swim to reach, it’s not recommended for novice snorkelers or swimmers. “It’s a hit-or-miss thing: sometimes there’s something or sometimes there’s nothing there,” said Capt. Rick about snorkeling in the coral heads. 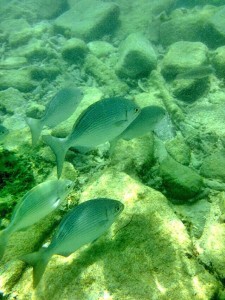 Snorkeling around the outer moat walls is also recommended for spotting fish that tend to linger there. 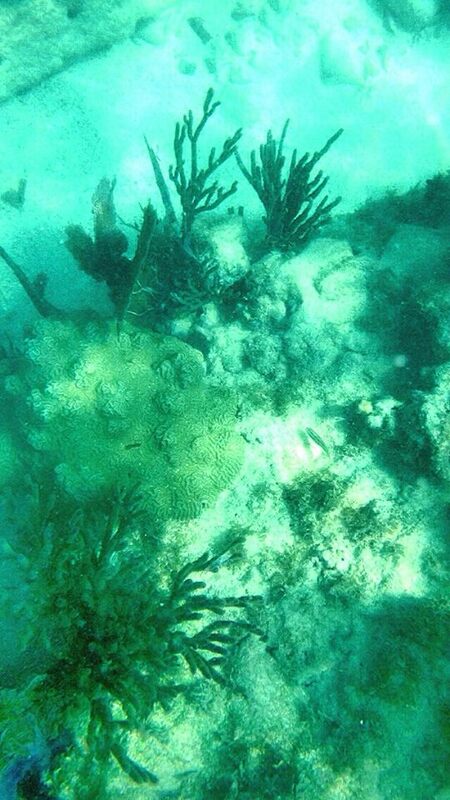 Keep in mind snorkeling within the moat is prohibited, as well as in certain Garden Key areas, including Seaplane Beach, the area to the left of the South Coaling Docks and areas around Bush Key. Bush Key and Long Key, which are the closest to Garden Key, are closed to public access. Some tips for novice snorkelers include starting off at the South Swim Beach as practice. Because it slopes off gradually, it is gentle enough for beginners to practice swimming with their flippers and become accustomed to breathing with the snorkel and mask. Novice snorkelers and swimmers can practice using their snorkeling gear at South Swim Beach in Dry Tortugas National Park (Photo by Roxana Maza). Once enough practice has been done, they can stay in South Swim and head to the South Coaling Docks, which is recommended before attempting the lengthy swim to the coral heads. For visitors planning to camp overnight in Garden Key, they are in luck! It seems the best time to snorkel, according to Capt. Rick, is when all the daytime visitors have gone back to the mainland. On a more serious note, the best conditions on the island for snorkeling is during the summer months, particularly due to its hot and humid climate, which means no wind and the ocean is clear and visible, akin to the Caribbean’s famous crystal-clear, blue waters. “Today’s a very good day in November to snorkel. The water’s 79 degrees Fahrenheit, so that’s not terrible,” said Capt. Rick. While snorkeling is considered relatively safe, there are precautions one should take before getting in the water. Number one: don’t swim alone. Because the best snorkeling spots requires swimming quite some distance away from the shore, a snorkeler or swimmer’s best bet is to go accompanied. While in the ocean, you’re safer in groups. And, Capt. Rick advises to “stand in the sand.” This means no standing on the sea grass or corals while snorkeling, as any contact will disturb them. Second, wear a snorkeling vest, particularly if you’re a beginner snorkeler or inexperienced swimmer. It helps keep you afloat and eases swimming with the fins on your feet. If the vests prove uncomfortable or unnecessary, the snorkel shack in the Dry Tortugas also offers long, thin flotation devices made out of a foam-like material, called noodles, that one can use under his or her chest, and is not attached like the vest would be. And, of course, be aware of your surroundings. The Dry Tortugas is also home to nurse sharks, fire coral, moon jellyfish, black sea urchins, lionfish and saltwater crocodiles, of which one of the local crocs is called Carlos, whose been a Dry Tortugas resident since 1999. “You can find all kinds of marine life out here. You can find the lionfish, which you don’t want to mess around with, you can see parrot fish, mangroves, snappers, gray angelfish and, sometimes, the queen angelfish,” said Capt. Rick. A school of fish swimming past rocks and rubble found in the North Coaling Dock ruins in Dry Tortugas National Park (Photo by Roxana Maza). “You’re gonna see barracudas and not so much tarpons, as the water’s getting too cool. You’ll see groupers and snappers. We even have a crocodile named Carlos, you can see him sometimes!” added Capt. Rick. Once the snorkeling adventure ensued, various things were confirmed rather quickly: the sand did not burn, walking into and out of the water with fins is a challenge of its own, the water felt a little colder than 79 degrees Fahrenheit and it was a bit murky that day. Snorkeling within the South Swim Beach region proved fruitless, with nary a fish in sight near and somewhat off the shore, and even near the moat wall. However, practicing swimming with snorkel gear on made it a worthy experience. In addition, South Swim Beach is probably one of the nicest beaches on Garden Key for leisurely swims and sun tanning, as many visitors seemed to already be doing that by the time we got there. While we were the first snorkelers in the area, we decided to stay relatively close to shore and the moat wall until more swimmers and fellow snorkelers arrived. At around 12 p.m., our wish was granted, and more snorkelers came to check out the marine life scene.Once we arrived at North Swim Beach, we realized the beach area was smaller, and littered with washed up corals. Spotting a few, stray moon jellyfish, we kept a cautious distance away as we held our positions in the water with our fins. Wearing the snorkel vest, I should have listened to Capt. Rick’s recommendation and used the noodle-shaped flotation device instead. An avid swimmer, floating was never a problem for me, but because this was my first time snorkeling, ever, I was being extra cautious and chose to be choked by my overly inflated vest. On the bright side, I wouldn’t drown. On the even brighter, bright side, the foot cramp that occurred mid-snorkel by the North Coaling Dock Ruins did not render me a human anchor. Quite some distance away from shore, a fellow snorkeler found an old coin in the sand below. “There must have been at least five of these, but a turtle was near the bottom and tossed sand around when we got too close, so we couldn’t find them anymore,” said the snorkeler, holding the coin up. It was silver and oblong-shaped, indicating it might possibly be handmade or had been eroded by saltwater. 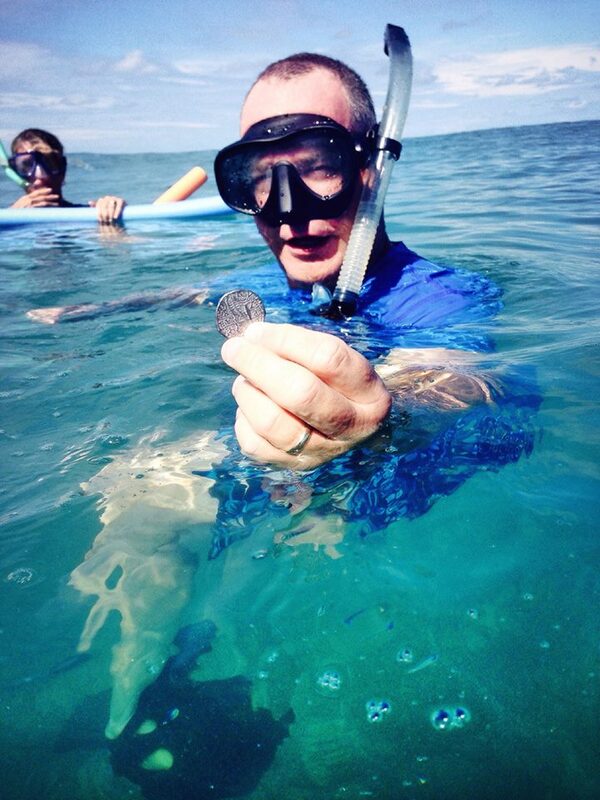 A fellow snorkeler found an old, silver coin near the North Coaling Dock ruins in Dry Tortugas National Park (Photo by Roxana Maza). About half an hour later while snorkeling with them, they found a conch and showed it to us. They let me hold it, and I was simply amazed at its heavy weight. A few moments later, the conch was let go. In the North Coaling Docks, I came across small schools of fish of all kinds, but the most intriguing were the parrotfish. They were bright and colorful, and medium sized, so they were extremely difficult to miss. 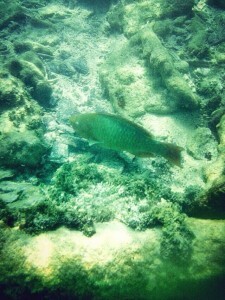 At one time, after clearing my mask a little, I dived down for a moment and was face-to-face with a parrotfish. It took what seemed like 10 seconds for my reaction to blow bubbles like a madwoman – you have to understand I was completely taken off-guard by the colorful specimen – and only then did the parrotfish scurry off. A parrot fish swimming in the North Coaling Dock ruins in Dry Tortugas National Park (Photo by Roxana Maza). We had close calls with moon jellyfish on more than one occasion, particularly because the water was a bit murky. Some of the jellyfish were small, so it was hard to see them until you came up to clear your mask or adjust yourself that you would spot it floating a few feet away. The corals were everywhere, and some were purple in color. The difficult part was staying away from the fire coral because of the slight tide that would toss you a bit, so swimming in the docks required some fast reactions if needed. Throughout the snorkeling experience, we made friends with an elderly gentleman named Mason Epperly, who drove from Atlanta to spend some time in Key West and made visiting Dry Tortugas National Park part of his itinerary. This was his first time at the park. “It was a great day down here, but it was a little murky on one side,” said Epperly. “Swimming around the corner of the pier, there we saw all kinds of beautiful fish and grain coral, fan coral, and the parrot fish! It’s been a beautiful day,” he added. Different varieties of coral are abundant in Dry Tortugas National Park (Photo by Roxana Maza). During our snorkeling adventure, we missed lunch on the ferry and both tours of Fort Jefferson. However, we did leave enough time to venture through the fort as the last piece of our trip. Snorkeling for the first time can be a little frightening, especially when you fear running into sharks or crocodiles. But, after a few hours in ocean with nothing but your fins, suffocating vest and hearing your own Darth Vader-induced breathing courtesy of the snorkel tube, you forget all the snorkel beginner awkwardness when you witness the beauty of the marine life below you, almost within arms’ reach. Ferry cost per person (day trip): Adult – $170; child (4-16) – $125; students 17+ (with I.D.) – $160; active military (with I.D.) – $160; seniors 62+ — $160. 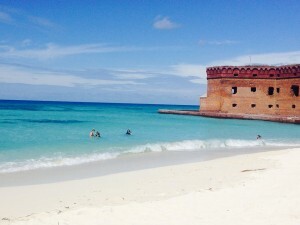 To purchase ferry tickets online, go to: http://www.drytortugas.com/rates-reservations. To purchase ferry tickets by phone, call: 1-800-634-0939. If traveling by car, you can park in the City Parking Garage on Grinnell Street, across the corner from the ferry terminal. Ferry terminal: Key West Ferry Terminal, 100 Grinnell Street, in the Historic Seaport. Check-in time: 7 a.m. Boarding time: 7:30 a.m. Departure time: 8 a.m. Arrival time at Fort Jefferson: 10:15 a.m., but subject to weather conditions. 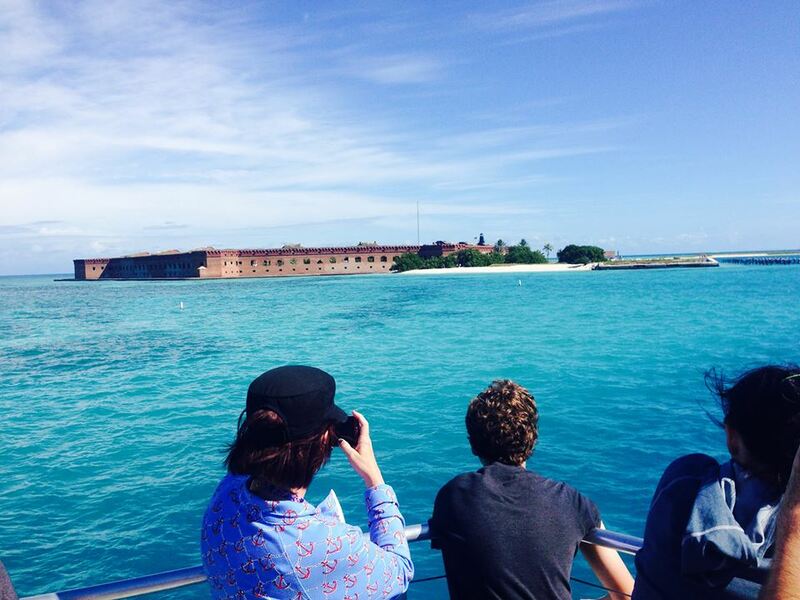 Fort Jefferson tour: 11 a.m.
Departure time: 3 p.m. Expected arrival time to Key West: 5:15 p.m., but subject to weather conditions. Total traveling time: about two hours and 15 minutes each way. Total time in Dry Tortugas: about four hours. What to bring: bathing suit, camera, sunscreen, sunglasses and hat, binoculars, beach towel, change of clothing, a light jacket, comfy walking shoes and cash. There is a small gift shop on the park for those interested in buying small souvenirs. Complimentary snorkel gear is provided, but own gear may be brought if desired. What NOT to bring: pets (unless certified service dogs), compressed gas canisters, firearms of any type, scuba gear and flammable accelerants. No shells or historical objects can be kept if found while snorkeling. Report the find to a park ranger.